Marcos Ronquillo, a 1979 graduate of the GW Law School, is running to be mayor of Dallas and was in D.C. last week for a campaign fundraiser. During his time at GW, he was part of Movimiento Legal Latino, a student organization, and participated in student protests. If elected, Ronquillo would be the first Hispanic mayor of Dallas. When GW Law School alumnus Marcos Ronquillo announced his bid for Dallas mayor in December, he stood in a pothole for four hours to prove that the city needed stronger infrastructure to support residents. Ronquillo will face incumbent Mayor Mike Rawlings in the coming May election, and is running on a platform that focuses on improving the city’s neighborhoods and public transportation. 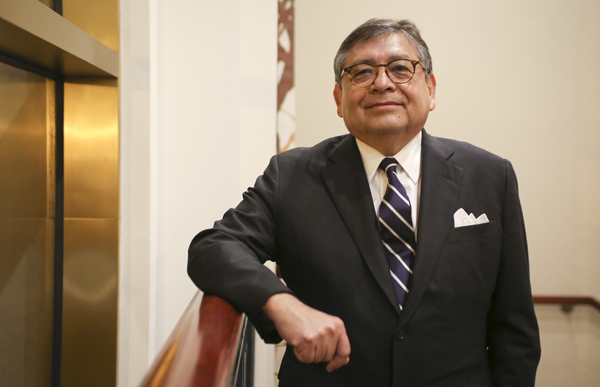 A 61-year-old attorney, Ronquillo has served on the law school’s Board of Advisers for the last 10 years. Ronquillo, who is Mexican American, is the former president of the Dallas Mexican American Bar Association, in which he spoke out against police brutality in minority neighborhoods. He was also the chairman of the Dallas Hispanic Chamber of Commerce and chaired an AIDS task force in 1989, the Dallas Morning News reported. He would be the first Hispanic mayor of Dallas, which is 42 percent Hispanic. “I think this is very important for our future, not because I’m Latino or Hispanic. I’m going to be the mayor of everyone in Dallas and I just happen to be Hispanic,” he said. After spending 35 years in Dallas, raising a family and representing government agencies as an attorney, Ronquillo said he decided to enter politics because he wanted to do more to serve his community. “It’s a very pedestrian, a very grassroots, a very neighborhood-oriented type of political circle,” Ronquillo said. Ronquilo said his least favorite part of the campaign has been “dialing for dollars,” but members of the law school’s Board of Advisers have helped coordinate fundraisers for him in D.C., Austin, San Antonio and Chicago. His campaign raised about $130,740 between 2013 and 2014, according to campaign finance documents. A 1979 graduate of the law school, Ronquillo received a full-ride scholarship to GW. He earned his undergraduate degree from Notre Dame University, which both of his adult sons also attended. Ronquillo said he was part of the Black Law Student Association and a Latino student organization called Movimiento Legal Latino during his time at GW. He remembered participating in student protests at GW, like one in support of Regents of the University of California v. Bakke, a landmark Supreme Court case in 1978 that ruled in favor of affirmative action. Running against an incumbent mayor can be tricky, said Michael Wagner, an assistant journalism professor at the University of Wisconsin-Madison who studies elections. He said it’s important for an incumbent to grab the attention of voters, especially if the race has little media coverage. A third candidate, Richard Sheridan, was indicted by a grand jury Friday for writing 666 on a dozen public locations, the Dallas Morning News reported. Sheridan, a perennial candidate, is outspoken against gay rights.